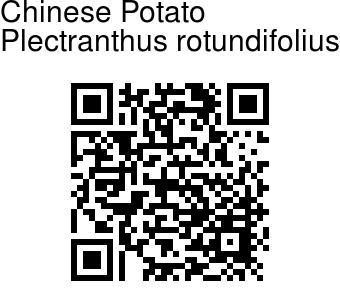 Chinese Potato is a perennial herb native to India and tropical Africa. It is cultivated in parts of West Africa, South Asia and Southeast Asia for its edible tubers. It is a herb with prostrate or ascending habit and a succulent stem reaching up to 15-30 cm in length, forming tubers in clusters around the base of the stem. The tubers are small and dark-brown. The stem is decumbent or ascending, quadrangular, with densely pubescent on the angles and roots at the nodes. The leaves are rather thick, juicy, faintly aromatic when bruised and arranged oppositely. The leaf-stalk is 1-3 cm long and puberulous. The blade is ovate to nearly round, measuring 2-6 cm x 1.5-4 cm, wedge-shaped at the base, coarsely toothed at the margins. The inflorescence is a terminal false spike, measuring 5-15 cm long, with distant whorls of 4-6 flowers. The flower-stalk is 1-2 mm long. The bracts are small. The sepal is bell-shaped, measuring 1.5-3 mm long, glandular-hairy and 5-toothed. The upper tooth is oblong, pointed and very short median teeth with rounded tip while the lower teeth is highly fused that forms an almost flat tip but ends abruptly in 2 widely apart acute tips. 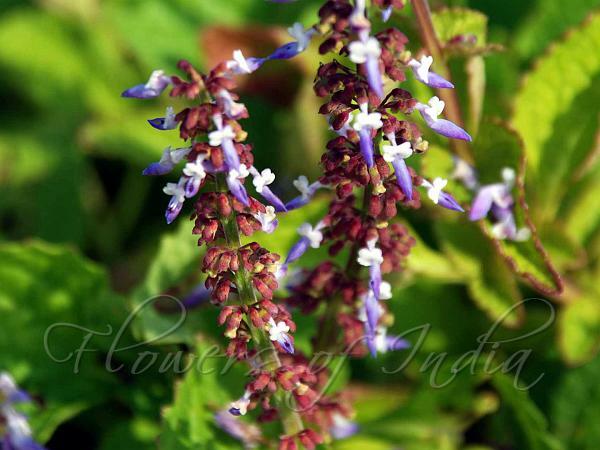 The flower is tubular and 2-lipped, measuring 7-12 mm long, light to dark violet, velvety and gland-dotted. The tube is strongly curved. The upper lip is very short and with 4-lobed while the lower lip is boat-shaped. There are 4 stamens that curved within the lower lip. They are up to 2.5 mm long, shortly unite at the base and envelope the style. The style is 2-fid and slightly exceeding the stamens. Flowering: September-October. Photographed in Chembuchira,Thrissur distt, Kerala.